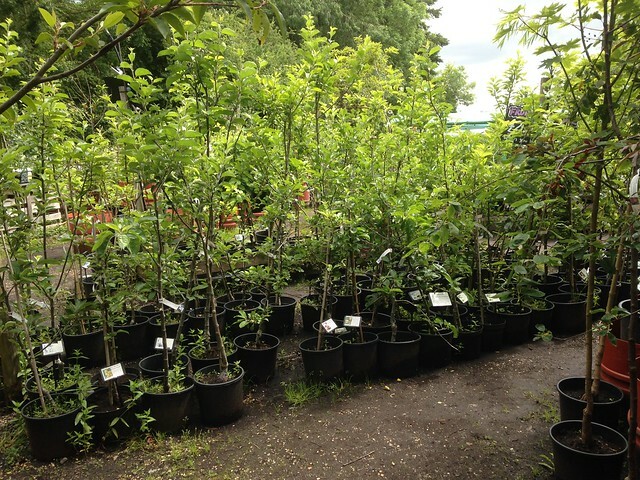 Monty Don has been bemoaning the fact that some “40% of gardeners get their plants, bulbs and seeds from supermarkets”. He says that their focus on cheaply produced, mass market plants is cutting down on the choice available. He might be right, but I would imagine that some of those 40% wouldn’t be gardeners at all if they couldn’t get what they needed from the supermarket. 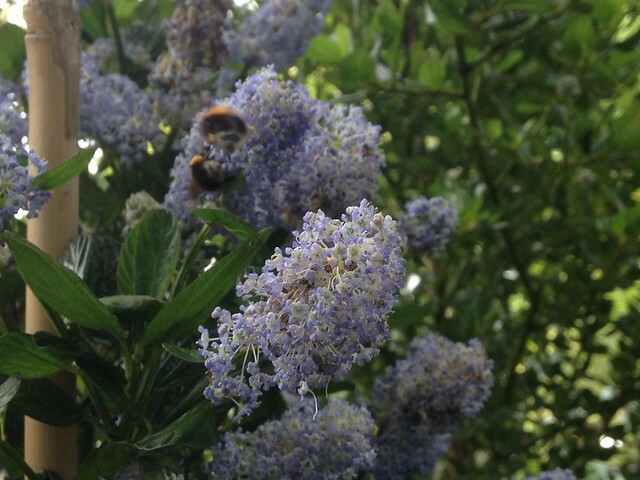 And some garden centres aren’t much more than garden supermarkets anyway, as you can tell from the number of plants that end up in the ‘dead zones’, where savvy gardeners can often find a bargain perennial or two that just need some TLC. The entrance is via a relatively narrow passage down the side of the house. Since it’s two-way traffic (with purple wheelbarrows) and the checkout ‘kiosk’ is there, it can be a little crowded. Once you’re through it into the garden area, you discover that it’s a bit bonkers (in a good way). An ’emporium’, indeed! There are plants everywhere, divided into the usual subsections, with charming homemade signs to direct you from one to another. It’s not entirely flat, or level, as little paths wander off from the main track to house more plants. It’s a bit like exploring a maze, for the first time visitor. There’s a special polytunnel where they keep their current selection of ‘rare’ plants; the sought-after bedding and vegetable plants are kept on trolleys in a glade. Herbs and perennials are on fairly standard staging near the entrance. 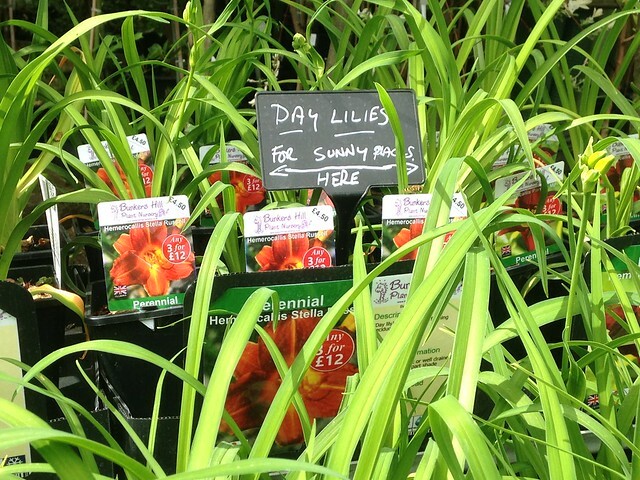 I was pleased to see a selection of daylily varieties, which I didn’t explore fully as I currently wouldn’t know where in the garden to put them. I shall give it some thought…. (I have two white daylilies about to flower in the front garden.) I picked up a mitsuba (Japanese parsley, Cryptotaenia japonica), and Ryan chose a mint – Mentha arvensis ‘Thai’, which is supposed to be mint with a hint of caraway…. 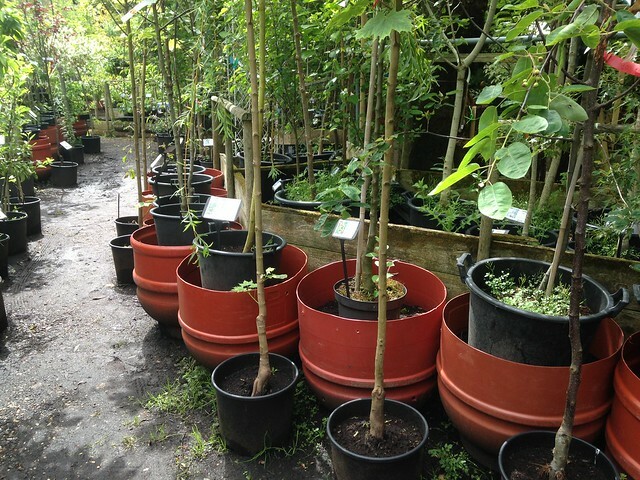 In small pots, they were £2.25 each. We could have chosen 5 for £11. One downside of the delightful chaos is that I couldn’t find the plant I’d seen on the website. The staff couldn’t either, when I enquired about it. They thought it had probably sold out (the lady who updates the website doesn’t work on Sundays), so I was a little disappointed. 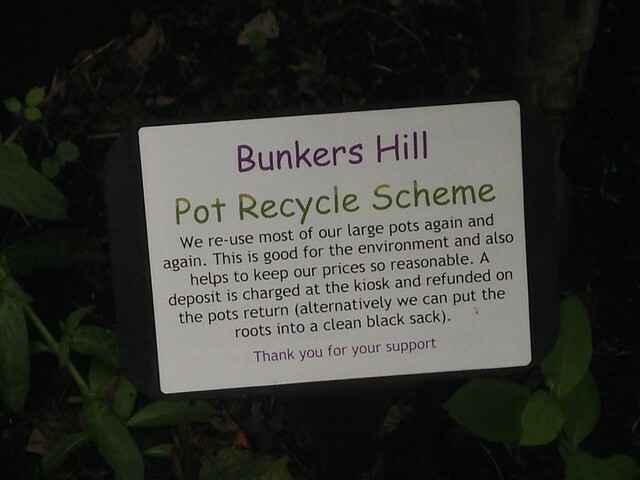 On the plus side, they are a Sylvagrow stockist, so I was able to replenish my supplies of peat-free compost. At the weekends they also offer free teas, which are self-service from a machine in a little summer house. You can also buy yourself a slice of nice-looking cake for £3 (iirc) and there’s a nice seating area with umbrellas. Yesterday there was a Gnome Hunt; we didn’t see any. 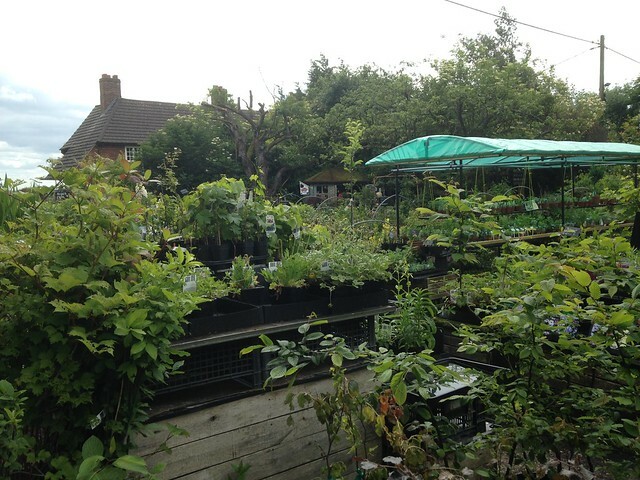 So we’ve added this nursery to the list of places we like to visit occasionally. 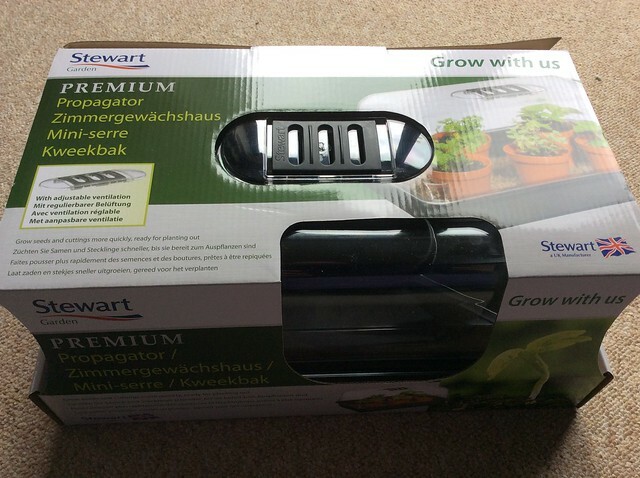 On Friday I received a parcel from Stewarts, sending me some things to try out that I’d picked out on their stand at the Garden Press Event in February. The ladies on their stand were one of my more memorable encounters that day; they took pity on my disorientated wanderings early in the day and enticed me into their stand to have a chat. Once I’d had one friendly encounter I found it much easier to nose about the rest of the stands! 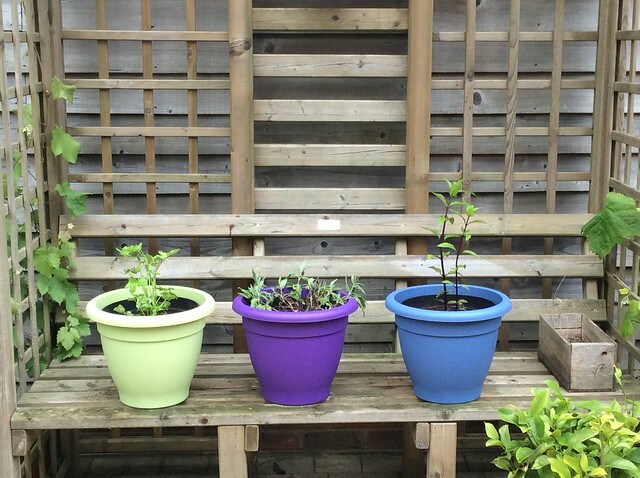 They’ve sent me a trio of their colourful new pots, which I have used as ‘outers’ to house the new mint and the mitsuba, which are planted into plain black pots. The outer ones will hold a bit of water in the bottom, and so keep the plants happier in dry weather. The third one is, for the moment, home to Salvia ‘Kate Glen’, which is looking a little sad due to lack of water, but will perk up soon. I think they make a great addition to my colourful ‘hot swap’ pots, that are for highlighting plants that are at their best at any given moment. They’ve also sent me a small propagator, that fits nicely on the windowill and will take care of seeds and seedlings for me. They’re endlessly useful, so I’m in no doubt this one will be a regular feature in my seedling photos!